The really good news, I think we can all agree, is that I can finally stop self-asterisking whenever a marathon comes up and I say “I ran the Chicago Marathon, just not all of it, but they called it off mid-race, but I wasn’t going to finish anyway”. 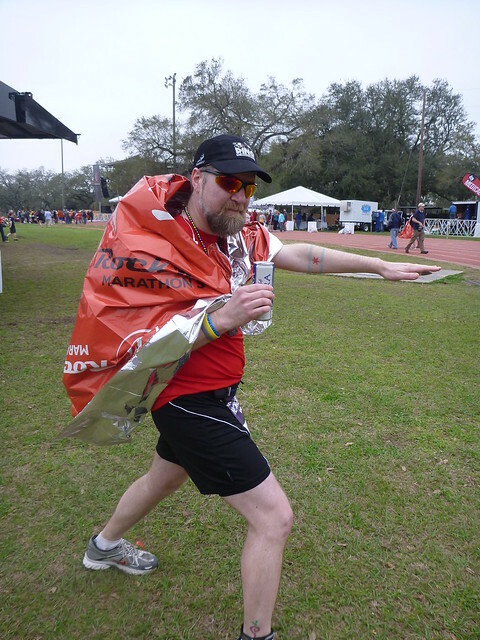 Anyway, now I can just say, “yeah, I ran the 2013 New Orleans Marathon”. New Orleans was as wonderful as it always is. That was actually a bit of a problem on Saturday, the day before the race, because we were staying right in the French Quarter and the temptation was to walk around all day and see everything. Mid-afternoon I had to be a jerk and made us go back to the hotel so that I wouldn’t wear out my legs. We did bring back a pretty good haul of street musicians’ CDs, the best of which is by Yes, Ma’am. Sunday morning we got up super-early and walked over to Cafe Du Monde for a super-healthy pre-race breakfast of beignets and coffee. Funny story, at Cafe Du Monde when you ask for a “half-caf” they think you mean half-black coffee, half-cafe au lait, not decaf. I thought we might see some other runners who would think that was a good idea as well, but at 5am I think we were the only customers in the place who weren’t still up from the night before. The race is part of the “Rock ‘n’ Roll” series of races and they really did give it that vibe. The National Anthem at the start of the race was played as a guitar solo by Mike McCready of Pearl Jam, who was running the half-marathon distance. There were band stages almost every mile along the route and most of the bands were pretty good, especially the New Orleans-style brass bands like Big Fun. Crowd-support was a little sparser than in Chicago, but the organizers had also scattered groups of middle-school cheerleaders between the aid stations. They had all dressed up in different “Rock” themed outfits: eighties, KISS, as actual LPs, etc. The best was a group that were dressed up as “Rock-n-Roll Grannies” and they’d tell runners that “your gramma is proud of you”. It was very Fantasy Grandma. The route is a great tour of New Orleans. The first leg goes out into the fancy neighborhood along St. Charles, which is part of the Mardi Gras parade route, so the trees all have beads stuck up in them. Then a loop back into the CBD (Central Business District) and then through the French Quarter. The halfway point is at City Park and is, I think, a rather cruel part of the route. The majority of the racers (13,500 out of 16,000) were running the half-marathon distance, so they peel off to finish and the road was suddenly a lot more empty. And then the remainder of the marathon route is a big out-and-back up to Lake Pontchartrain and as you pass the park on the west side you can see (at least, if you’re as slow as I am) much faster runners who are finishing the whole thing. Anyway, up to the Lake it was, and through another fancy neighborhood of big houses, and then back down to City Park, where my sweetheart was waiting for me. And a very nice medal. And a crappy beer. Run-wise, I made a few mistakes that led to some pain and slowness that I think could have been avoided, especially given how successful my 20 mile training run in New York went. The biggest was simply that I went out too fast. I was telling myself over and over, from the start of the race, to stick to a 12-minute mile pace, and to take plenty of slow-downs and even walks. But I had my headphones out, to be engaged in the ambient music and the runners around, and so I wasn’t getting my Nike+ info every mile. And it’s easy to get caught up in the enthusiasm of everyone around you. So I ran the first 7 miles at about 10’30” per mile and it just knackered me out. By the halfway point I was feeling worse than I had at the end of 20 miles a few weeks before, and I was starting to have some knee pain. At 4 and a half hours, I had to give myself a little pep talk when it was obvious that I wasn’t going to finish under my, completely imaginary, 5 hour goal. BUT. I ran a marathon and had a great time doing it. And I was mostly free of pain by the next day. Mostly. And we had a whole extra day in New Orleans to enjoy with our dear friend/relatives Chad and Elizabeth, who drove over from Jackson to hang out with us and take us to great eating spots like Domenica and Cochon Butcher (the latter of which we enjoyed enough to sit out in the rain to eat our lunch).